The key component of perceptual skill in football are identified via talent discovery and development. Football over the years have served as a veritable tool for social integration and it's socioeconomic impact has helped in fostering diplomatic relationships between ethnic groups, organizations as well as nations. The passion and crave for the game made of 32 leather panels of a pig skin goes beyond the activities on the 110' by 75' metres lush green pitch be it natural or astro turf, but other 'carbonaro effects' such as marketing, ticket sales, construction of state of the art facilities, viewership, followership, media and unending post-game analysis. The present-day game has had an immense quantum leap thereby placing it as the most populous and most watched sports. 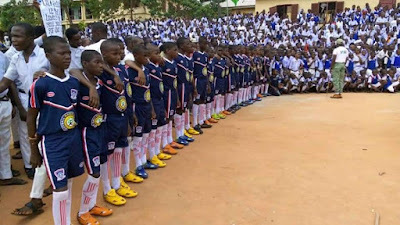 The advent of the concept 1F1F, One Family One Footballer being the pet project and brainchild of Dr. Patrick Ifeanyi Ubah has come to revolutionize the game in Nigeria and by extension the African continent with a vision to raise tens of thousands of young and vibrant talents who can harness their skills, learn the ropes and build a blossoming capacity to be the next best thing and join the bandwagon of superstars such as Lionel Andres Messi, Christiano Aveiro Dos Santos Ronaldo, George Opong Weah and many more. Just like FC IfeanyiUbah have thrived in 4 years of its nascent history culminating into winning of 8 major trophies; NEROS Anambra FA Cup (4 times), Inaugural South East-South South Football Championship, 2016 Federation Cup rechristened Aiteo Cup and 2017 Super Cup; The 1F1F project has come to stay. Dr. Patrick Ifeanyi Ubah, Chairman ANSFA, has continued to set the pace in human resource management and human capacity development, with his vision, intuition and philanthropist gestures exhibited in sponsorship of over 30 individuals to Brazil 2014 World Cup, all expense paid trip to London in December 2016 to watch Live Barclay's English Premier League game between WEST HAM UNITED V ARSENAL, and the last being sponsorship of over 65 persons drawn across various divides in the country to Russia 2018 World Cup, the success story of the 1F1F will be told by generation yet unborn and posterity will judge. History will be made on Saturday 15th of September 2018 with the launching of 1F1F following on the strong foundation which has been laid with the preliminary launching in Russia where the cream de la cream and who is who in the global game came to witness and keyed into the ideas of a man of an Igbo extraction with Nnewi roots. The wait is finally over as another LA MASIA and WEST HAM Football Academy is set to be replicated on Igbo Soil with its tentacles spreading across the nation and the 52 footballing nations of the african continent. Just like the West Ham academy has being the biggest single contributor to the English national team "Three Lions" with players such as BOBBY MOORE, SIR GEOFF HURST, HARRY REDKNAPP, ALAN CURBISHLEY, PAUL INCE, RIO FERINAND, JOE COLE, MICHAEL CARRICK, JERMAINE DEFOE, GLEN JOHNSON and recent graduates such as FREDDIE SEARS (Ipswich Town FC), JAMES TOMKINS (Crystal Palace FC), LIAM RIDGEWELL (MLS Portland Timbers), JUNIOR STANISLAS (AFC Bournemouth) and other names too numerous to mention, 1F1F will surely contribute immensely to all Nigeria's national teams for the U-17, U-20, U-23 and the Super Eagles. Dr. Patrick Ifeanyi Ubah is on a mission to change the narratives, let's join hands to make this dream bear good fruits now and many decades to come. Let us support the man with vision. Lets support Dr. Patrick Ifeanyi Ubah.